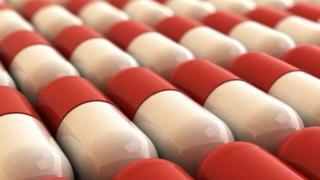 US authorities have accused six pharmaceutical firms from the US, India and Australia of price-fixing. It is alleged the companies conspired to raise the price of the antibiotic doxycycline and diabetes drug glyburide. The civil lawsuit has been filed in 20 US states. It follows criminal charges being brought against former executives at one of the accused firms. US drugmakers Mylan, Heritage Pharmaceuticals, Teva Pharmaceutical USA and Citron Pharma are named in the lawsuit alongside India's Aurobindo Pharma and Australia's Mayne Pharmaceuticals. Mylan, Teva and Aurobindo have denied the allegations. Heritage has been accused of being the "principal architect" of the case. On Wednesday the US Department of Justice charged two former executives with price-fixing. Heritage said it was co-operating fully with the probe and had filed its own civil complaint against the pair. Australia's Mayne confirmed it was among the companies named in the case brought by anti-trust investigators. Its shares plunged 22% on the news, and while it did not comment on the allegations, it said the probe and legal proceedings would "not have a material impact on its future earnings". "No assurance can be given as to the timing or outcome of the investigation or legal proceedings," a spokesperson added. Citron Pharma is yet to comment. The civil case follows a two-year investigation started by the office of Connecticut's Attorney General George Jepsen - and alleges that firms conspired over steak dinners and "girls nights out." Mr Jepsen told Reuters that lawsuit was just "the tip of the iceberg", saying price fixing in the generic industry was "widespread and pervasive", involving "many other drugs and a number of other companies." One Democratic senator claims the price of 500 doxycycline tablets rose in the US from $20 to $1,849 in just seven months. Generic prescription drugs: Are prices excessive?